Scuffles broke out between activists from the anarchist ‘black bloc’ and the demonstrators before Jean-Luc Melenchon’s speech at the Place de la Republique. The black-clad anarchists attempted to force their way towards the stage, shouting and spraying Melenchon’s supporters. Some tore down placards and pelted the protesters with stones, according to RFI. Also present at the scene, anti-fascist activists tried to make their way onto the stage. However, security prevented them from so doing, as seen in footage from RT’s France correspondent. 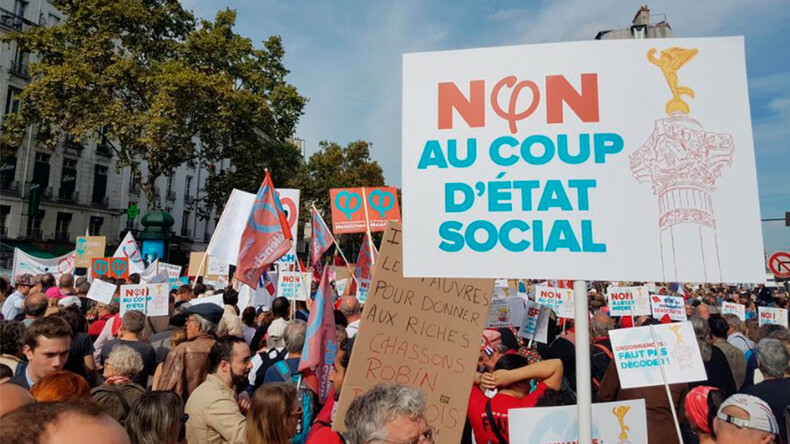 “We won’t let them empty the poor’s pockets to feed the rich!” urged the leaflets handed by La France Insoumise (France Unbowed) party before the demo kicked off. The leader, Melenchon, called on the French youth, retirees and workers to join the Saturday rally, scheduled for 2pm local time at the Place de la Bastille . The party organized transfers to bring protesters from across France, chartering nearly 130 buses. As the event inched closer, people could be seen waiting in anticipation, holding banners and flags of the France Unbowed party. A number of left-wing organizations joined Melenchon’s call to rally, with alter-globalist association Attac, Socialist presidential candidate Benoite Hamon’s July 1 Movement and the Lambertist Trotskyists, as Le Monde reported. Delegations from the French Communist Party, as well as the Greens are also expected to show up. “We want to strike a blow and block Macron," France Unbowed’s Eric Coquerel said. On Friday, President Macron signed sweeping labor decrees into law, overhauling large parts of the 3,300-page code. The changes will give smaller companies more freedom to negotiate conditions with employees, reducing the role of unions in talks. The reforms will also enable companies to discuss issues, such as 13th month salary, loyalty bonuses, sick days and maternity leave directly with staff. In addition, the changes will also set a cap on the pay-outs awarded to workers found to have been unfairly sacked at industrial tribunals. This is a condition that the previous government of Francois Hollande was forced to abandon. The changes signed by Macron are due to take effect next year. Ahead of the approval thousands of protesters throughout France flocked to the streets, marching against what some placards called “the law for the bosses.” Staged by trade unions, including the powerful CGT, the Thursday rallies saw a relatively modest turnout compared to marches last week, when some 225,000 people turned out.